In December 2015, the world’s governments will convene at the COP 21 meeting in Paris to attempt to reach a global consensus on addressing our climate crisis. The nuclear power industry will attempt to use this forum to gather formal support for their obsolete, failed technology as a climate solution. But nuclear power is no solution at all. We will be in Paris in December to demand a safe, clean and affordable nuclear-free, carbon-free energy system. At COP 6 in The Hague in 2000, we kept nuclear power out of global carbon trading mechanisms. In Paris, we will similarly prevent nuclear power from attaining any support as a climate mechanism and instead ensure that the world moves, as fast as possible, to a true clean energy future. The organizations whose logos appear on the bottom of this page formally launched this campaign on June 16, 2015. The first step is an international petition that will be presented to world leaders in Paris in December. The Campaign’s COP 21 Action Page is here. Media: Here is a list of experts from the Don’t Nuke the Climate campaign available to speak to the media at COP 21, along with contact information and areas of expertise. Organizations: Sign the petition here. More than 520 organizations have signed to date (December 4, 2015). Individuals: Sign the petition here. Text of the petition in Spanish, French, German, Japanese, Russian. (Note: petition must be signed on English version). Vote for Electricite de France for the international Pinocchio greenwashing award! This is in recognition of its efforts–and those of us in the U.S. will recognize this approach from our nuclear utilities and trade groups–to convince people that nuclear power is somehow a climate solution. In fact, for a myriad of reasons, nuclear power is counterproductive to effectively addressing climate change. Because of the new prohibitions against street demonstrations in Paris during COP 21 (see below), it is vital that all who support clean energy make their voices heard across the world in support of the strongest possible international response to the climate crisis and for a nuclear-free, carbon-free energy future. In the U.S., actions will be held across the country on Sunday, November 29, sponsored primarily by 350.org. We encourage everyone to join these actions and to make the nuclear-free, carbon-free position heard. If you don’t see an event close enough to you, get together with friends and start one of your own! Actions are also being planned in many cities for December 12. If you’re one of the thousands who have one of our flags or posters left over from last year’s climate march in New York City, bring it to the action closest to you! And here’s a new poster you can print to take with you. Note: because of the November 13 terror attacks in Paris and the three-month extension of a state of emergency, there will be major changes to what is allowable at the COP 21 meeting in December. For example, the mass demonstration scheduled for December 12 will not be permitted (although there is a global petition to French President Francois Hollande to lift the ban; sign here). We are developing alternative plans to ensure the nuclear-free, carbon-free message is as visible and effective as possible during COP 21 and will update the schedule below as soon as we know firm details. *On December 12 we’ll begin with feeder marches and human chains across Paris–including one of the large Nuclear-Free Carbon-Free contingent we are mobilizing–flowing into one of the largest climate demonstrations in history. Depending on the outcome of the COP 21 conference, this will either be protest or victory celebration. *Every day, we’ll be inside the conference center, meeting with government delegations to help ensure that the world’s climate plans do not include nuclear power or fossil fuels, and do support clean energy. Here’s a list of actions and events currently planned. The international campaign website is here. Campaign highlight updates are here. Lodging options for activists at COP 21. Some ideas about where to stay for activists coming to Paris. November 30, 2015. When a campaign strikes a nerve. Our response, published on GreenWorld, to a misguided attack on the campaign from a Finnish group attempting to undermine it. August 3, 2015. Huge Victory! Final EPA Clean Power Plan removes most pro-nuclear provisions, withdraws support for existing reactors, recognizes nuclear power will play little role in addressing climate.Talking points. Letter to NIRS supporters. September 2, 2015: Greens/EFA conference at the European Parliament in Brussels: Dismantling the nuclear argument: Why nuclear is no climate-friendly solution. Including a presentation by WISE’s Peer de Rijk on the Don’t Nuke the Climate! campaign. 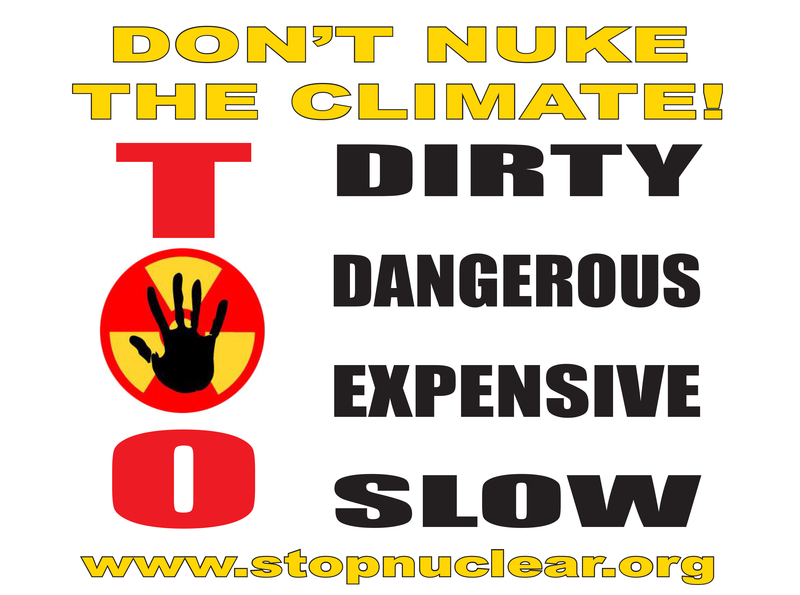 Don’t Nuke the Climate! The launch of a new campaign. From June 16, 2015 GreenWorld. Press release announcing the campaign. Quotes from leaders of the seven organizations initiating the campaign. Pope Francis’ Encyclical on climate includes several passages highly skeptical of nuclear power as a technology, and thus as a climate solution. Excerpts here. Fact sheet: Nuclear Power and Climate: Why Nukes Can’t Save the Planet. Study: Can Nuclear Power Slow Down Climate Change? by Professor Storm van Leeuwen, commissioned by WISE. Briefing Paper: Nuclear Energy is Dirty Energy (and does not fit in a clean energy standard). Briefing Paper: Killing the Competition. How nuclear industry is attempting to block climate action, stop renewable energy and subsidize old reactors. Report: Power Shift: The Deployment of a 21st Century Electricity Sector and the Nuclear War to Stop It. Describes how the nuclear power industry is seeking consumer bailouts for its uneconomic reactors while working to undermine adoption of clean renewable energy. NIRS’ Nuclear-Free, Carbon-free page highlights various studies showing different ways to attain a nuclear-free, carbon-free energy system by mid-century or sooner. NIRS’ Nuclear Power and Climate page contain a vast amount of information on the issue. NIRS’ Alternatives to Nuclear page contains information on renewable energy sources. GreenWorld, NIRS’ blog chronicling the transition to a nuclear-free, carbon-free society, frequently publishes articles relevant to these issues. It’s the best place to keep on top of new developments. In September 2014, NIRS led the large and highly visible Nuclear-Free, Carbon-Free Contingent to the People’s Climate March. This page, created for that campaign, provides both a historical record of the event but also numerous links to useful information, graphics and the like.